That Inscrutable Thing: Jefferson Davis, American by William J. Cooper, Jr.
Jefferson Davis, American by William J. Cooper, Jr.
And the insight? This tug of war between the “all men created equal” language of the Declaration of Independence and the various definitions for “members of the body politic” that have graced the pages of the Constitution, is one of the great transcending narrative arcs of the American story. Slave, woman, homosexual, enemy combatant—we keep having the same argument over and over again, don’t we? Who has rights in our society? It was going on then and it’s still going on today. Here’s another insight. When it comes to secession, Davis was not wrong. States likely did have the power to secede from the Union, and the war waged against them to bring them back was likely an illegal one. Before the Civil War, a great many more people viewed the United States as what it was originally intended to be—a collection of independent states. Davis was certainly one of them. he said once in Congress, and he lived very much by the creed these words defined. The title of this biography, American, is uniquely poignant in this regard, since Davis had a clear fealty and affection for the United States of this formulation. Indeed, in many of his public comments about the Union—both before and after the war—his words would stir the patriot hearts of yesterday and today. To our modern sensibilities, it seems all the more strange that a man such as this should lead the upstart nation responsible for dissolving this precious Union. But in doing so, it is clear that Davis believed he was acting constitutionally, that secession was a right guaranteed by the document he so revered. And after the war, as the nation struggled to find a crime to convict Davis of, their perennial lack of action seemed to do little more than prove Davis’ point. Granted, there was a lot of politics going on, partisan divides with demagogues of both stripes jockeying for power. We often forget this about the past—that historical actions were driven by partisan loyalties similar to those that drive us today. Reconstruction after the Civil War was really no different in this regard, as the new party in the White House (Andrew Johnson and the Democrats) sought to reassert their power over the party of Lincoln. A reappearance of numerous southerners in Congress could of course lead to substantial strengthening of the Democratic party. Moreover, in these new [state] governments whites attempted to exercise close and harsh control over the freed slaves through laws known as Black Codes, which severely restricted the rights and economic opportunities of blacks. Neither of these developments troubled President Johnson. A resurgent Democratic party might well look to him for leadership. And because he shared the general white southern view of race relations, the shackling of freed people caused him no great difficulty. For the political and ideological goals of the Republican party, the party identified with the North and the victorious Union war effort, he had little sympathy. It was against this political backdrop that the former Democratic Senator from Mississippi was jailed and held for several years with no charges pressed against him. From time to time the United States Government would make motions that it planned to try him for treason, but it never made good on the promise, realizing that the ramifications of losing such a case—and thereby providing a clear court precedent that secession was not treason—would be far worse than letting Davis go free. Eventually, they released him on bail, and he was never again called to appear in court. Her loss had delivered him a massive emotional blow. In his “Autobiography,” written in the last year of his life, he spoke of “liv[ing] in great seclusion” for “many years” after her death. Her memory and his vision of that memory obviously stayed with him for the remaining fifty-four years of his life. A number of years after the tragic event, according to a family story, Davis was rummaging through an old trunk when the sight of one of Knox’s slippers so staggered him that he lost consciousness. Mother and father were devastated. Varina [Davis’ second wife] depicted herself as “tortured,” while Jefferson spoke of her “irreparable grief” that caused periods of “painful depressions.” An acquaintance portrayed Jefferson as “overwhelmed with affliction and look[ing] worse than I have seen him in many years.” He had not faced such an emotional trauma since Sarah Knox’s death almost two decades before. Varina recalled an anguished man who “walked half the night and worked fiercely all day.” “A child’s cry in the street well-nigh drove him mad,” she wrote. To the end of his life he never forgot the brief existence of his first-born. A servant brought news of the accident. Mother and father rushed home to watch and hold their boy in his last moments of life. An eyewitness recorded Varina’s “flood of tears and wild lamentations.” “Unutterable anguish” marked Jefferson’s face, which “seemed suddenly ready to burst with unspeakable grief, and then transfixed into a stony rigidity.” His wife recalled his crying out, “Not mine, oh, Lord, but thine.” Turning away a courier, he moaned, “I must have this day with my little child.” Exercising “terrible self control,” the father with his burden of “heavy sorrow” paced the floor of his bedroom throughout the night. Mother and father were devastated. Davis called him “the bright boy…the hope and pride of my house.” His “heart bowed down at the loss.” Davis said all his disappointments and sorrows had not increased his ability to bear them. And finally, late in life, on the death of their fourth and final son, stricken with yellow fever at the age of twenty-one. His death staggered his parents. Davis cried out in anguish: “The last of my four sons has left me. I am crushed under such heavy and repeated blows. I presume not God to scorn, but the many and humble prayers offered before my boy was taken from me, are hushed in the despair of my bereavement.” Yet even in his torment, Sarah Dorsey spoke of his “bear[ing] it manfully.” He spoke of his son’s letters to him, a toothpick and walking stick the boy had made for him, and a pocketknife that had been a present. “These are put away to be preserved and looked at, as long as I live,” he wrote. A devastated Varina lay helpless in bed, prostrated by a dangerous fever. Sarah Dorsey said she did not leave Varina’s sickbed for six days and nights, except to bathe and change clothes. Mother and father had only their two daughters remaining. There is something unsufferably sad about these passages to me, something that makes me see Jefferson and Varina as something closer to the simple human creatures that they were. They lived so long ago, dressed in funny clothes, and had strange thoughts, and only look out at us stiffly through those grainy photographs. But they were real, weren’t they? In their struggle to deal with the grief of losing their children, they weren’t just real people. They were people just like you and me. And finally, there’s the war. Two key thoughts here. First, the political shuffle that started the whole thing should be filed as one of the gravest crimes against humanity the world has ever seen. This book is decidedly from Davis’ point of view, but provides enough detail about Northern strategy to show that Abraham Lincoln was playing the same game. Loud, public protestations about never wanting to begin the war, but being “forced” into it by the political machinations of the other side. And all the while, never a thought given to the 600,000 Americans who would die as a result of those first few shots fired in Charleston Harbor. They didn’t know it would cost so many, of course—not then. But as the casualties started mounting up, and the charade of peace negotiations flared up from time to time between Richmond and Washington, we would again hear the same rhetoric—we have a moral duty to stop the blood shedding—and again see the same result—the shots continuing to get fired. Davis, in all of these situations, was both self-deluded and adamant about his own innocence. He agreed with his guests that he could not leave untried any approach that might result in peace. He told them he wanted peace and deplored bloodshed as much as they did, but claimed that “not one drop of the blood shed in this war is on my hands.” “I can look up to my God and say this,” he went on, because he had striven for a dozen years to prevent war, but he had failed. This passage brings up the great theme of what the war was really all about—States’ Rights or slavery—and that’s not a subject I intend to wade deeply into. In the end, I think, it depends on who you ask. Ultimately, the war was about both, and which was the cause and which was the effect will probably be debated for generations to come. But here I’m more interested in pointing out that the two men who had it within the power to end that war before too many men had lost their lives, both claimed that they were powerless to stop it. They were either liars to history or liars to themselves or both. But now it no longer matters. For the winner is revered as the greatest President of all time, and the loser, as shown above, was never convicted of any crime. But put all that aside for a moment, because here’s my second point about the war—the Confederates never had a chance to win. This has always been my impression. I used to think the war only lasted as long as it did because of how corrupt, disorganized and incompetent the Union Army and its generals initially were. But this book has helped me see that the Confederates were just as bad—if not worse. Here’s a passage that describes how Davis comparatively saw Robert E. Lee and Joseph E. Johnston, at the time that Davis relieved Johnston of his command and turned the defense of Atlanta over the John Bell Hood. In relieving Johnston, Davis compared his campaign to Lee’s. Although both generals had retreated before a superior foe, the president viewed their circumstances and performances as quite different. Lee had battled all the way and with Early had even tried a daring, albeit unsuccessful, move to regain the initiative. At Petersburg, he had Grant as much at bay as Grant had him. With a bloodied and weary army, Grant could neither overpower nor dislodge the Confederate defenders. Lee knew he could hold on for a considerable time. Moreover, throughout the weeks from the Wilderness to Petersburg he had kept Davis thoroughly informed and had promptly posted the president on his intentions and actions. In contrast, Johnston, in the same amount of time, had fallen back over twice as great a distance and through country more advantageous for defense. He never seriously tried to grasp the initiative, and he constantly cried for help from outside his army. He never slowed down or weakened Sherman, who reached Atlanta relatively more powerful than Grant at Petersburg. According to a compatriot, Davis worried that Johnston thought “his army is not for the defense of the country, but that he must at all hazards protect the army.” Perhaps most important, Johnston never confided in Davis. He never gave the president any reason to have confidence in him. Of course, that would have been difficult because he had so little in himself. Johnston in this book is a real liability to the Confederacy, and he’s not the only one. If you thought the North was plagued with in-fighting among political generals, you need to read some more about Braxton Bragg and his crew of lieutenant commanders in the Army of Tennessee. In a famous episode, all of Bragg’s lieutenants wrote to President Davis after Bragg sacked one of their number, expressing their lack of confidence in Bragg and their desire for him to be replaced. Davis, whose judgment appeared clouded by the idea that their nation’s circumstances would “lift men above all personal consideration and devote them wholly to their country’s cause,” decided to keep Bragg in charge. Soon after this decision, the Army of Tennessee would be utterly routed by Ulysses Grant at Chattanooga and Missionary Ridge. Cooper goes into a good amount of detail about the fractiousness of the situation and Davis’ ill-informed reaction to it, but for me one message rings clear. A good deal of Grant’s success and rise to power came because of incompetence and in-fighting on the Confederate side—especially in the West. Cooper points out in his preface that previous historians have been unkind to Davis. He is “generally portrayed as an ideologue with poor political skills and as a second-rate leader with a bureaucratic mind-set, who failed spectacularly in his star role, especially when compared to Abraham Lincoln.” Indeed, one such historian, David M. Potter, is mentioned by Cooper as having suggested that if Lincoln and Davis had exchanged positions, the Confederacy might have prevailed. This being the first serious treatment I’ve read of Jefferson Davis, it’s probably appropriate for me to reserve my judgment on the merits of his skills. Each biographer, I know, has his own biases, and will ultimately present his subject in the light that displays them best. But to suggest that any man—even the secular god that we have created out of Abraham Lincoln—could have led the Confederacy to victory seems like the height of folly to me. Forget about Lincoln, if we’re horse trading in the fantasy Civil War league, I’d let the North keep Lincoln and try to draw a second Lee. But, of course, there was no second Lee. And the fact that there was no second Lee, and that the war could not be won with only one, it conjures up an odd thought in my head. How long would the war have lasted if Lee had decided not to fight? How many fewer men would have died? Given how perceptive and intelligent Lee was, was there ever a point when he considered for a moment his own affect on those around him, and the chance that it may simply be prolonging the inevitable, at the cost of thousands of lives? And couldn’t that realization have been reached before Appomattox. For apart from the incompetence of other generals, ultimately the war was lost because the South lacked the number of personnel they needed to prosecute it successfully. As this book plainly portrayed, late in 1864, after Hood’s abysmal performance in Tennessee, with people and soldiers clamoring for his replacement, Davis was forced to leave him in command. There simply wasn’t anyone capable of replacing him. It’s not unusual when reading one of these historical biographies for me to stumble across a minor episode that strikes me with the uniqueness of its human story, filling me momentarily with the desire to turn it into my next great novel. First it was Teddy Roosevelt and his son Kermit and the time they spent together on the River of Doubt. Then it was John and John Quincy Adams crossing the Atlantic for the first time on the Boston. Now, its Sarah Ellis Dorsey and the life she led and the lives she nurtured at Beauvoir. 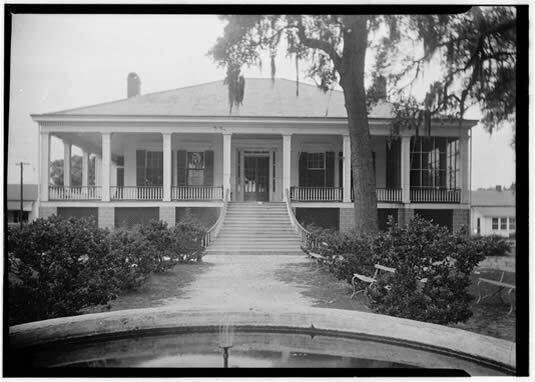 January 1877 found Jefferson Davis once again at Beauvoir, the Gulf front home of Sarah Dorsey. Idolizing Davis as the Confederate president, and believing him the great man of the age, she invited him to make her home his home. Tired of wandering, with no other attractive options, and ready to start on his memoirs, he accepted her invitation. He had already decided to make the Mississippi coast at least his temporary abode when Sarah Dorsey’s offer provided him a most suitable situation. He did not have to buy anything, and he could easily move. Forty-eight years old in 1877, Sarah Ellis Dorsey had been born in Natchez into a wealthy plantation family with holdings in Mississippi and Louisiana. Her family had known the Davises, and she was a contemporary of Varina’s. An unusually gifted young woman, she received a superior education in Natchez and Philadelphia. She married in 1853, and with her Maryland-born husband Samuel Dorsey settled on a Dorsey-owned cotton plantation in northeast Louisiana. A staunch Confederate during the war, she never stopped venerating the cause and its noble leaders, particularly Jefferson Davis. Sarah became an author of some note, writing both fiction and nonfiction. In 1873 the Dorseys bought and moved to Beauvoir, where Samuel died two years later. As it had for most southern plantation magnates, the war had greatly diminished the Dorseys’ wealth and property. Yet a sizeable fortune remained. Beauvoir was a raised cottage, but its considerable size, impressive flight of steps, Greek Revival details, and extensive grounds gave it the air of a “mansion…of vernal beauty.” Built in the early 1850s to take advantage of sea breezes, the house was supported on nine-foot brick pillars above an unfinished basement. Its front broad steps rose to a verandah that extended across the front and halfway around each side. The interior, with a wide central hall and floor-length windows, was also designed to take advantage of the natural ventilation. All eight rooms of the residential story opened onto the front or rear galleries. Architectural refinements helped make Beauvoir impressive. The exterior featured square wooden columns aligned above the basement pillars. The balustrade that flanked the steps continued along the base of these pillars, which had Doric capitals topped by a broad but simple frieze. There were also symmetrically placed chimneys as well as Doric pilasters by the doorway and three-part wooden shutters at the windows. In the interior, the frescoed walls and ceilings of the hall and parlors were notable. Their rococo themes of shells, garlands, and even mythological figures were balanced by the elaborate marble mantelpieces of the parlors. Carved door casings added more impressive detail. The grounds magnified the distinction of Beauvoir, though it had never been a working plantation. Two cottages on either side of the mansion featured floor-length windows, smaller-scaled versions of the galleries of the main house, and pagoda-like roofs. The one on the east was prepared for Davis; it contained a bedroom and a study. The usual kitchen, stable, storerooms, and servants’ quarters stood in the rear. Kitchen and flower gardens were nearby, and orange trees and vineyards covered many of the estate’s acres. Running just a half-mile behind the estate, and with a flag stop, the Louisville & Nashville Railroad made both New Orleans and Mobile easily accessible. Davis’ patroness wanted to give him more than room and board. She hoped that Beauvoir would become his haven, where he would be safe from the bruises inflicted by the larger world. She would become his protectress, providing sanctuary and worshipful care. Upon his arrival, she reported him in poor emotional shape. “So he is in a very troubled condition of mind…” she wrote, “troubled about his affairs & anxious about his wife’s health, which is not much improved.” She said she had difficulty getting him involved in his memoirs. In time he did become stronger, both physical and emotional pain subsiding. With Sarah Dorsey and various guests, Beauvoir could be a lively place. She entertained many people who came to pay their respects to her hero. She, he, and at times others engaged in what one participant called “much interesting talk” on various topics, including women’s suffrage, which she supported but Davis opposed. And Sarah Dorsey could still put on a lavish dinner. Her Christmas table in 1877 included oysters, raw, fried, and in soup, turkey, mutton, beef, crabs, salmon, sweet and Irish potatoes, vegetables, cranberry sauce, and jellies. Sherry and superb claret helped it all go down. Then came the main course: a roasted peacock with feathers in full display, as if it were alive. At the close of a Christmas reception, she and Davis led off in the Virginia reel. While Davis was getting used to Beauvoir, Varina remained in London. Even in the summer of 1877, illness still kept her from rejoining her husband. Her extended absence stirred thoughts of home: “I so often long for that old shackle-down house on Court Street where I had all my children in my own home,” she confided to Jefferson. Finally, in October, she sailed from Liverpool to New York, where Burton Harrison met her and sent her on her way to Memphis and her daughter. Varina did not go to Beauvoir. While in England she learned from newspaper accounts that her husband had taken up residence there with Sarah Dorsey, whom she had known in Natchez and as a schoolgirl in Philadelphia. Varina did not welcome the regime at Beauvoir. She told Jefferson that though she was grateful for Sarah Dorsey’s kindness to him, she never wanted to see the place. “Nothing on earth would pain me like living in that kind of community in her house or that of another,” she asserted. Because she could say nothing positive about his benefactress, she wrote Jefferson, she would say nothing. Polly concurred, writing her mother that she did not like Sarah Dorsey. Moreover, she had given her father her opinion and said her mother should never go there. In Memphis, Varina stood her ground; she even moved into a boardinghouse when her daughter had houseguests for an extended period. Varina’s boycott did not end easily, but ultimately she realized her husband had nowhere else he could work on his book, and she also had no place to go. In May she appeared at Beauvoir, where Sarah Dorsey had arranged a party in her honor, though uncertain that Varina would appear. Harmony seemingly reigned, but Varina’s performance dramatized the tension in the household. Just before the reception she ran into the nearby woods. Sarah Dorsey followed her and somehow sufficiently allayed her distress so that she returned for the gathering, where she sparkled. A truce was established between the two women that over time would lead to genuinely warm relations. Varina replaced her former nemesis as Jefferson’s helpmate on his book. Then, in the fall of 1878, when Varina was seriously ill, Sarah Dorsey nursed her with unstinting care and kindness. That’s it. That’s the story I want to write, the story summarized in this short segment—three pages out of more than the seven hundred describing Davis’ life. The woman ahead of her time in intellect and vision, her seaside retreat for restoring mind and body, the fallen hero who fought bravely for the wrong cause, the timeless gatherings of forgotten intelligentsia, the partner separated from her cherished one because of politics and jealousy, the fear and regret of a life only partially lived. In this triangle and their tangles it seems there are the seeds of every human aspiration—both those worth celebrating and those not. Labels: Biography, William J. Cooper Jr.
My family is an old Virginal family that dates back to the 1600's. I found your account of the facts to be true & to the point! The true grief this war caused my family brings such sorrow that even the mighty James River it self could not wash away!I have had the pleasure in my line of work to welcome many tourist to the state of Virginia & one of the first question without fail they ask of me is where are the Civil War battle grounds? At first I found my self socked by such a question but quickly came to understand that this simple question was due to people that had no real concept of the magnitude & horror of what really had taken place on the very ground they stood on! No state in this Country would ever again tasted as much blood from so many men from so many states no matter the cause! My simply answer to such a profound question has been your standing on Civil War ground now.Yes the great cause was lost & yet it was won ! What a truly painful paradox.